A face filled with boredom: Wow, Bowman. Nice work. 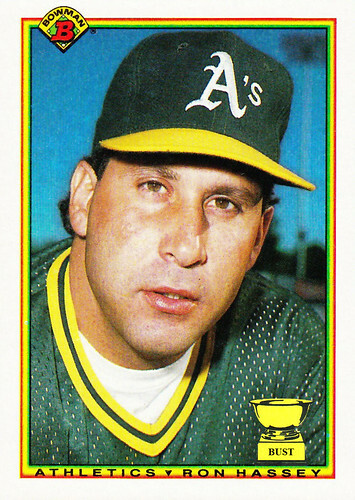 This card is so boring, it looks like it bored Ron Hassey while the photo was being taken. The photographer had to put the camera lens 4 inches from Hassey's jowls just to keep him awake. There's no sense of place, save for the gas station sign reaching into the sky behind the A's catcher, which, actually, seems appropriate. And the Bowman boys could have done so much with this assignment. Hassey is a catcher, so the photo could have depicted him squatting, which is much better than slack-jawed staring. Or maybe we could have seen a side shot, allowing Hassey's mullet curls to have a moment in the sun. But no, we're subjected to an awkward stare-down with a backup catcher who had as many holes in his swing as he had in his practice jersey. Well, at least now we have intimate knowledge of Hassey's pores.